A family in Nairobi has been thrown into mourning following the bizarre death of a 29-year-old man who was shot dead by his father on Sunday. Police reports indicate that the father, Assa Nyakundi, accidentally shot dead his son, Joseph Nyakundi, near their house in Muthaiga, Nairobi. 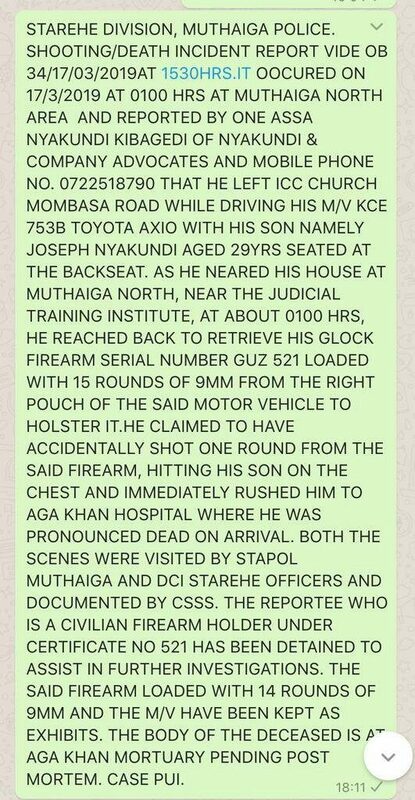 The father and son were driving to their Muthaiga North house from the ICC Church along Mombasa Road at about 1 pm when the shooting occurred. 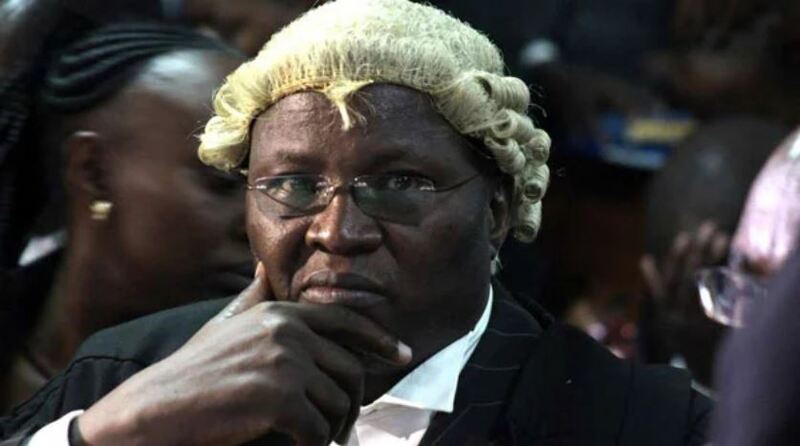 Mr Nyakundi, a top lawyer based in Nairobi, is a licensed gun holder and had a Glock pistol with 15 bullets with him at that time of the incident. They were driving in a Toyota Axio with Nyakundi’s son in the back seat. As they neared his house, Mr Nyakundi decided to change the position of his pistol in the car. Nyakundi, who turned himself in to the police, further told detectives that as he transferred the Glock from a pouch in the car to a holster, it discharged a single bullet that hit his son in the chest. He rushed Joseph to the Aga Khan Hospital where he was pronounced dead on arrival. He later went to Muthaiga Police station where he reported the matter. The police said they have visited the scene of the crime near the Judicial Training Institute in Muthaiga North and the Aga Khan University Hospital. “The said firearm loaded with 14 rounds of 9mm bullets and the m/v have been kept as exhibits,” added the police. Confirming the incident, Nairobi police boss Philip Ndolo said they are investigating the incident. “It is unfortunate a life has been lost more so his son. We are looking into the incident,” said Ndolo. Assa Nyakundi runs Nyakundi and Company Advocates law firm in Nairobi. He is currently representing Nyeri Magistrate Pauline Chesang who has been charged with the murder of her husband and lawyer Robert Chesang. He is also representing a number of suspects in the National Youth Service Two case. Nyakundi also represented controversial televangelist James Ng’ang’a who killed a woman through ‘drunk’ driving in 2015.